Dynapac’s experience in Continuous Compaction Control (CCC) or Intelligent Compaction (IC) dates back to the late 70s. Since then we have been able to offer our customers the opportunity to control compaction work in real time and to document the completed work for improved quality control. We offer the same advanced levels of control and documentation on both singe drum vibratory rollers for soil compaction (the CA range) and tandem vibratory rollers for asphalt compaction (the CC/CG ranges). The first level is the Compaction Meter, now using Evib readings for both soil and asphalt. On asphalt rollers this is supplemented by the Asphalt Temperature Meter. It utilizes two temperature sensors, one at each end of the roller to register the surface temperature of the asphalt. The temperature is measured by the sensor that is currently at the front depending on the driving direction. This minimizes the influence of surface water from the drum sprinklers. 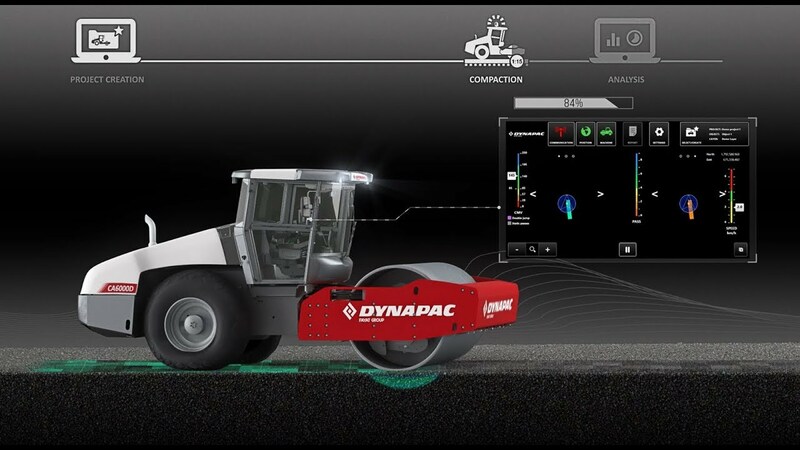 The second level of the system is the Dynapac Compaction Meter plus the Dyn@lyzer with GNSS (Global Navigation Satellite System). This registers all the Compaction Meter data and continuously displays the compaction results to the operator on the computer screen. The data is, at the same time, recorded and saved allowing full traceability and quality assurance. The GNSS receiver (such as GPS, GLONASS, Galileo, etc.) gives the precise position of the roller on the job site at all times. The level of accuracy depends on site requirements. Dynapac’s documentation system records and maps stiffness and stiffness progress of the compacted layer in real-time as well as temperature and number of passes. A GNSS receiver is used for positioning. Positioning accuracy may be selected between Differential-GNSS (decimeter accuracy) or RTK-GNSS (cm accuracy) depending on site requirements. The DYN@LYZER can be used as a quality control and assurance tool as well as a production tool to optimize the compaction effort. DYN@LYZER Multi is to be used when two or more rollers are working together on the same layer. All machines that are connected get near real-time updates on the total number of passes that were made. Connection is made over short-range wireless communication. Compaction to a target value. Calibration is required. Compaction to a target compaction progress, relative increase between two consecutive passes. Calibration is not required. Counting the number of passes, vibratory as well as static. Calibration is not required.